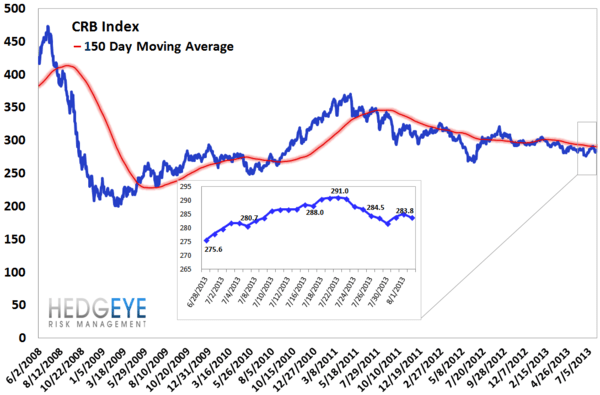 Takeaway: Both the short and intermediate term FIG setups remain favorable with very few watch areas currrently. Last week was another ho-hum week from a risk monitoring standpoint. 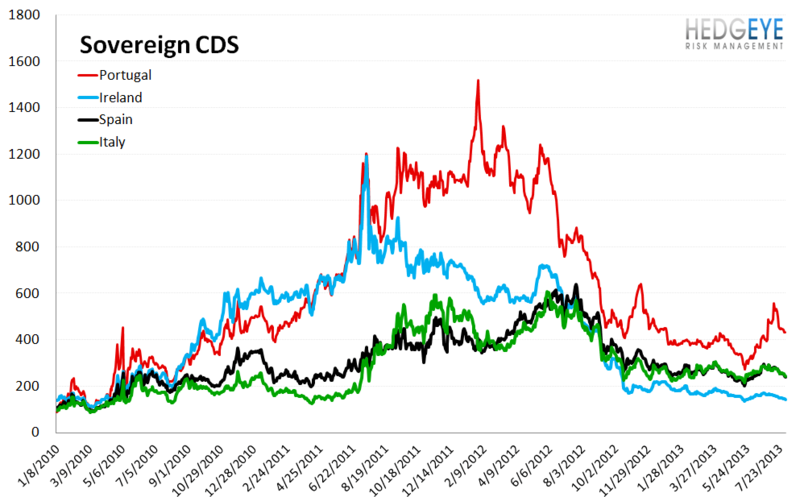 US financial credit default swaps were essentially unchanged. European financial swaps were broadly improved (average -14 bps). High yield rates were nominally higher (+5 bps), TED spread was nominally lower (-1 bp), Euribor-OIS was wider by 1 bp and the Shifon Index tightened by 30 bps. All this points to a broad-based calm globally. On a short term basis, the only risk measure that deteriorated was Muni CDS, which rose 4 bps to 95 bps, reflecting modestly higher default expectations as investors re-review pension statuses nationally. On an intermediate term basis, we continue to see a lot of positives. 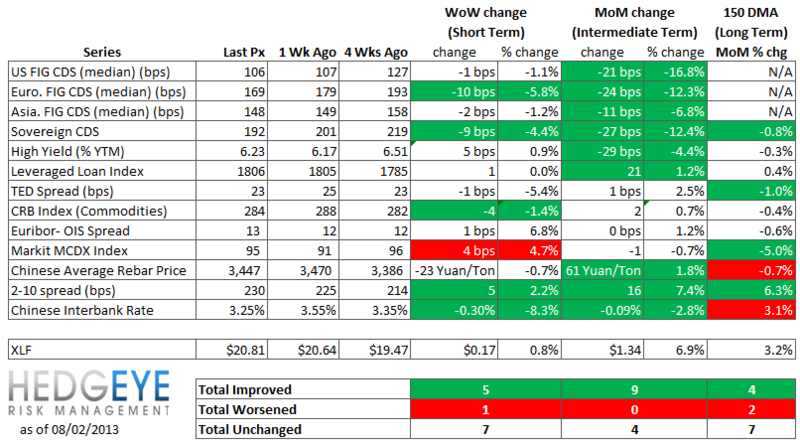 Note the preponderance of green in the middle columns (MoM) of our summary table below. 1. 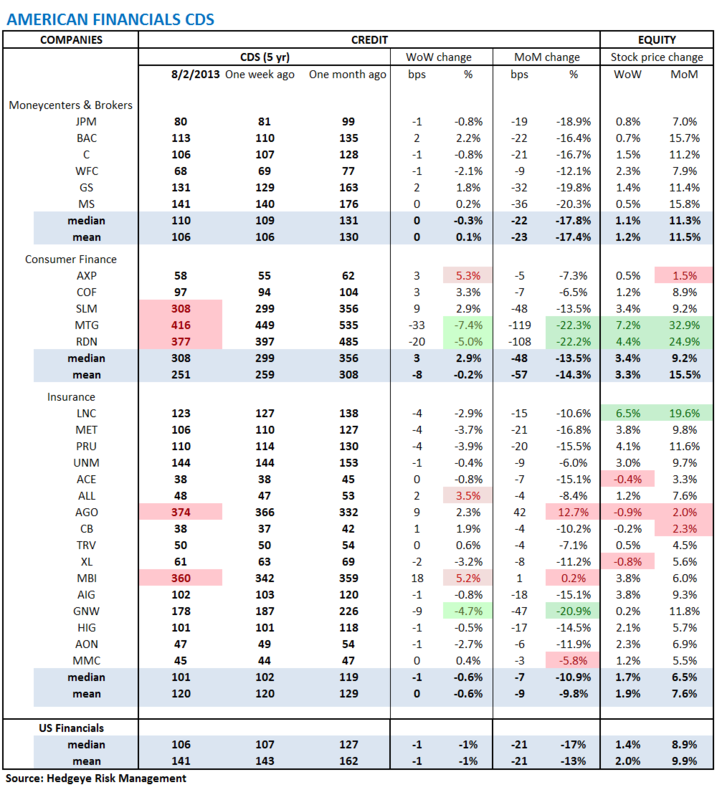 American Financial CDS - The biggest movers last week were the mortgage insurers, MTG and RDN, which saw swaps tighten 33 bps and 20 bps, respectively, to 416 bps and 377 bps. Overall, swaps tightened for roughly half (15 out of 27) of domestic financial institutions. 2. 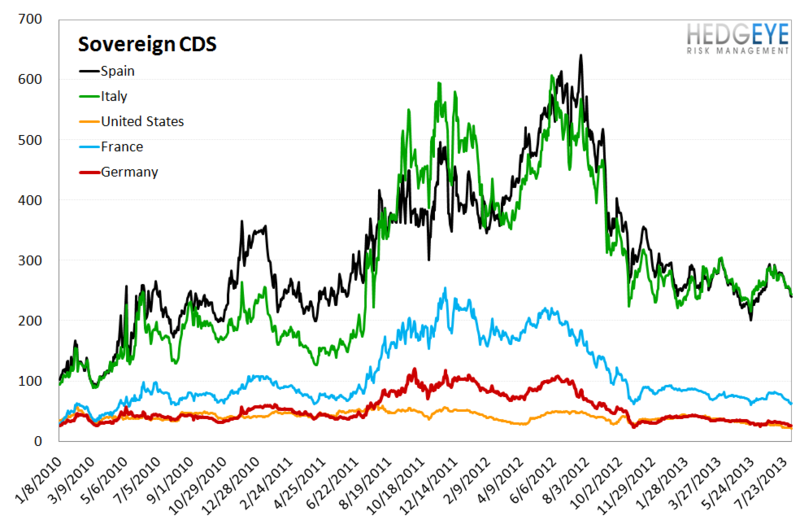 European Financial CDS - Last week saw large improvements in French, Greek, Italian, and Spanish swaps. In fact, the only company that saw swaps rise was Sberbank of Russia, where swaps backed up another 14 bps to 238 bps. Sberbank swaps have become increasingly tethered to the outlook for oil prices. 3. 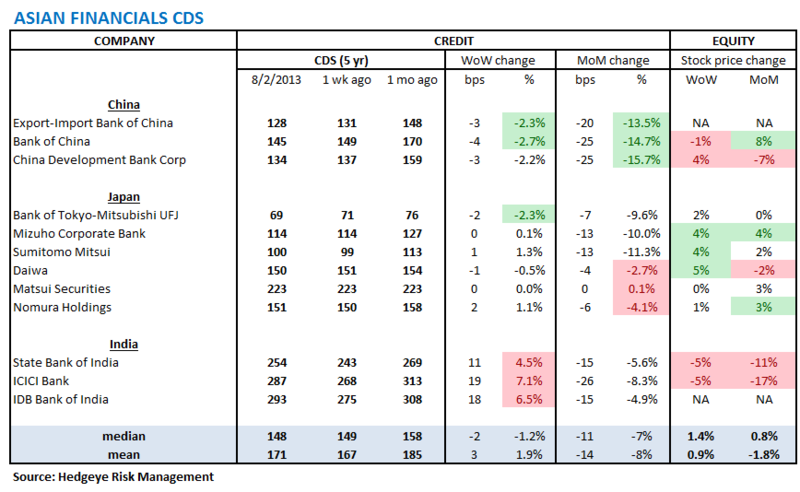 Asian Financial CDS - Indian banks were notably wider last week, rising 11 - 19 bps across the group. Swaps in Chinese banks were tighter, while Japanese banks were flat to mixed. 4. Sovereign CDS – Last week saw another across-the-board tightening in sovereign credit default swaps. 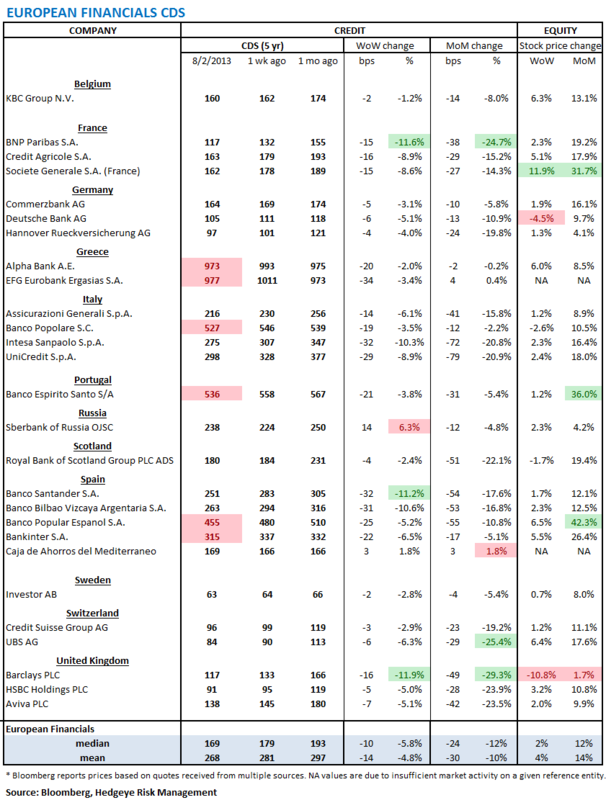 Spain, Italy and Portugal led the improvement with declines of 15 bps, 12 bps and 11 bps, respectively. Ireland and France followed with 8 bps and 5 bps. The U.S., Germany and Japan were all tighter by 1-2 bps. 5. 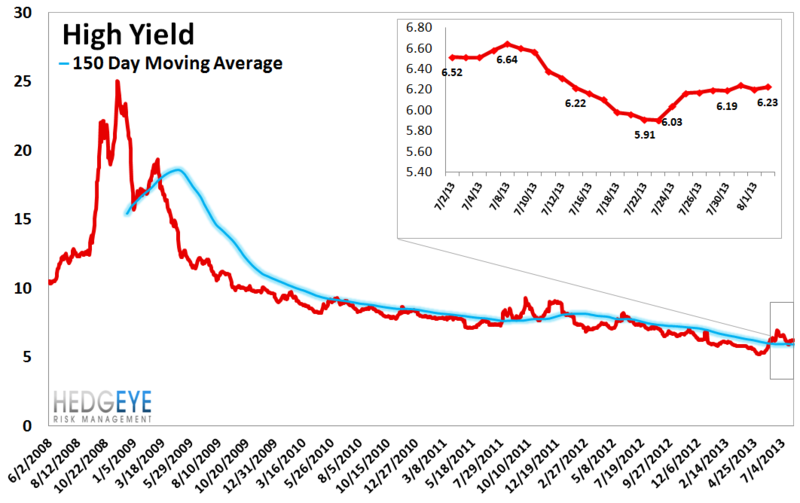 High Yield (YTM) Monitor – High Yield rates rose 5.5 bps last week, ending the week at 6.23% versus 6.17% the prior week. 6. Leveraged Loan Index Monitor – The Leveraged Loan Index rose 0.6 points last week, ending at 1805.85. 7. TED Spread Monitor – The TED spread fell 1.3 basis points last week, ending the week at 23.4 bps this week versus last week’s print of 24.7 bps. 8. CRB Commodity Price Index – The CRB index fell -1.4%, ending the week at 284 versus 288 the prior week. As compared with the prior month, commodity prices have increased 0.7% We generally regard changes in commodity prices on the margin as having meaningful future consumption implications. 9. Euribor-OIS Spread – The Euribor-OIS spread (the difference between the euro interbank lending rate and overnight indexed swaps) measures bank counterparty risk in the Eurozone. The OIS is analogous to the effective Fed Funds rate in the United States. Banks lending at the OIS do not swap principal, so counterparty risk in the OIS is minimal. By contrast, the Euribor rate is the rate offered for unsecured interbank lending. Thus, the spread between the two isolates counterparty risk. 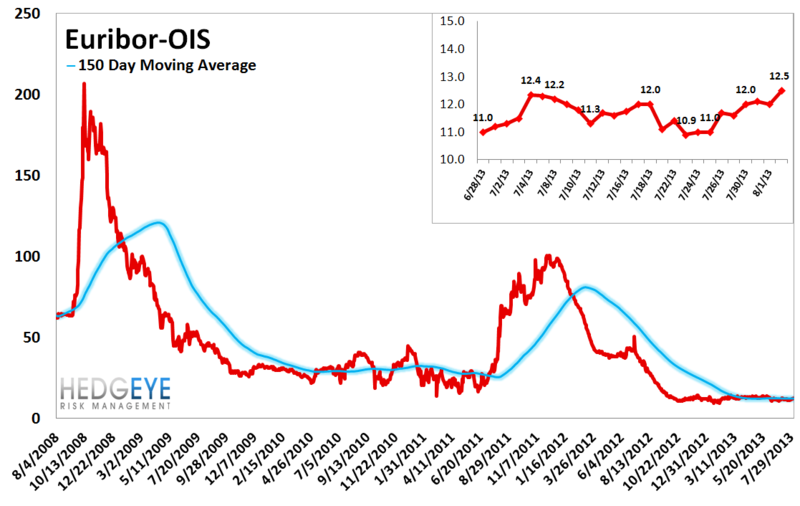 The Euribor-OIS spread widened by 1 bps to 13 bps. 10. 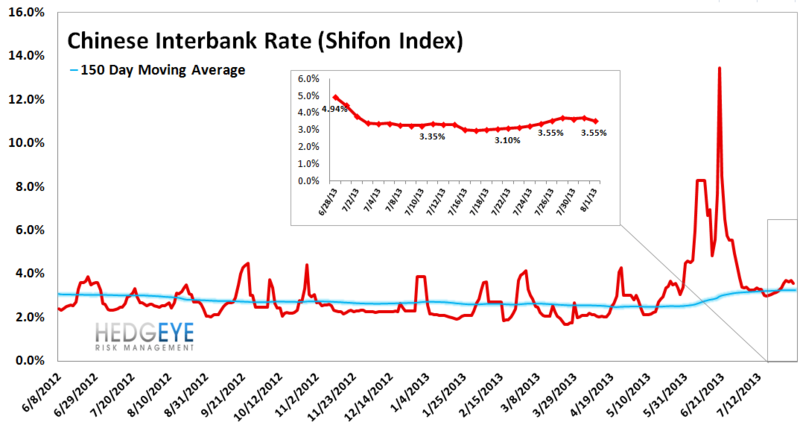 Chinese Interbank Rate (Shifon Index) – The Shifon Index fell 30 basis points last week, ending the week at 3.25% this week versus last week’s print of 3.55%. The Shifon Index measures Chinese banks’ overnight lending rates to one another, a gauge of systemic stress in the Chinese banking system. 11. 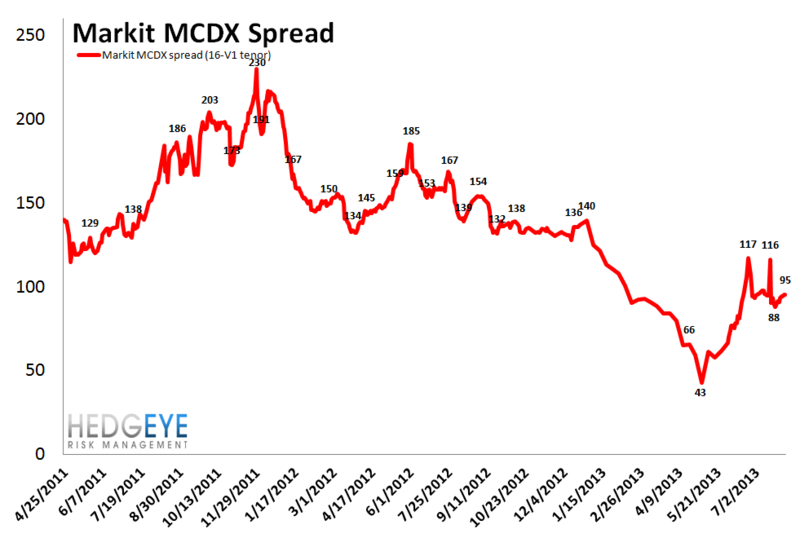 Markit MCDX Index Monitor – The Markit MCDX is a measure of municipal credit default swaps. We believe this index is a useful indicator of pressure in state and local governments. Markit publishes index values daily on six 5-year tenor baskets including 50 reference entities each. Each basket includes a diversified pool of revenue and GO bonds from a broad array of states. We track the 16-V1. 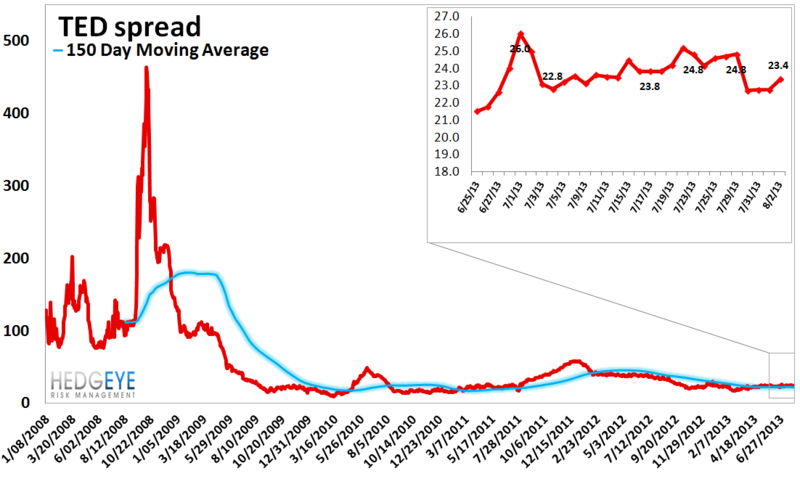 Last week spreads widened 4 bps, ending the week at 95.3 bps versus 91.1 bps the prior week. 12. Chinese Steel – Steel prices in China fell 0.7% last week, or 23 yuan/ton, to 3447 yuan/ton. 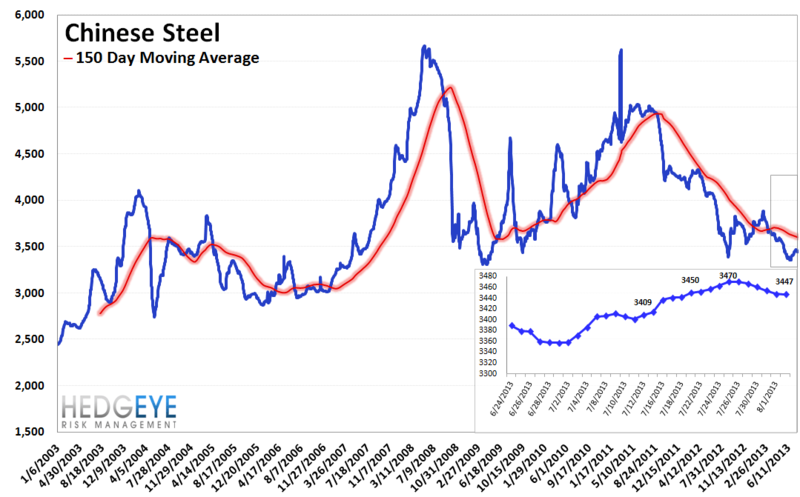 We use Chinese steel rebar prices to gauge Chinese construction activity, and, by extension, the health of the Chinese economy. 13. 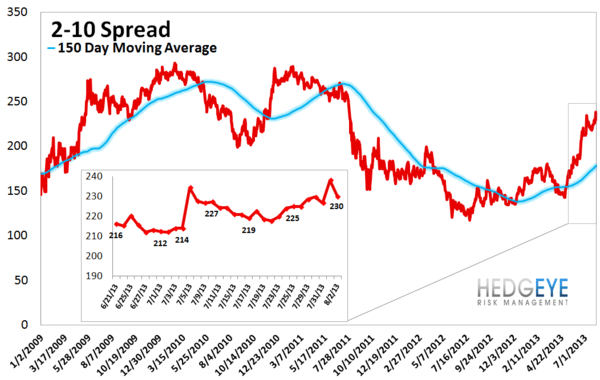 2-10 Spread – Last week the 2-10 spread widened to 230 bps, 5 bps wider than a week ago. 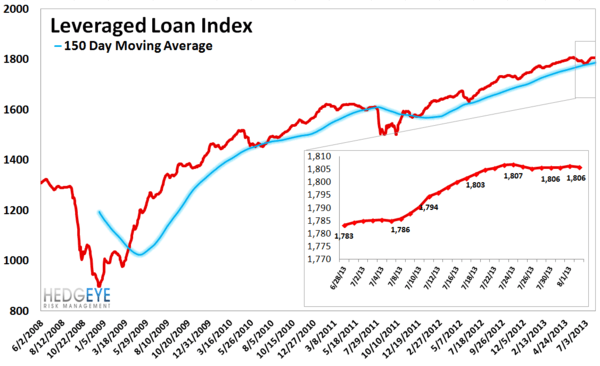 We track the 2-10 spread as an indicator of bank margin pressure. 14. 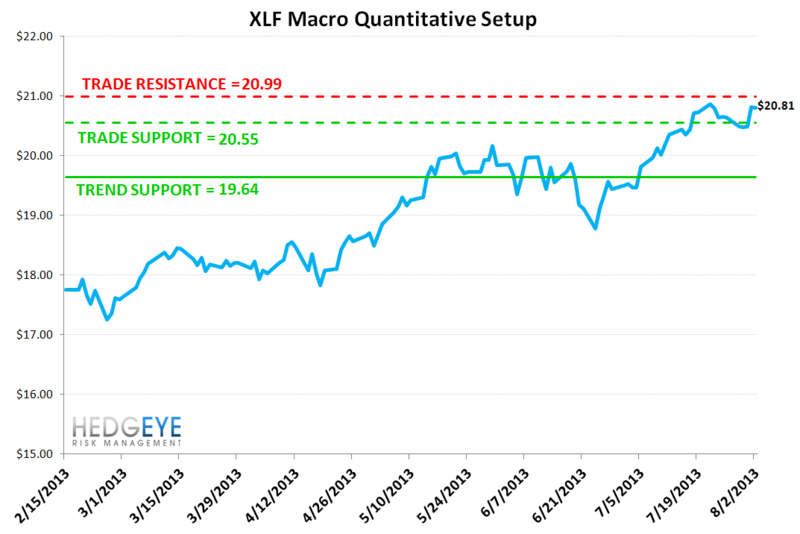 XLF Macro Quantitative Setup – Our Macro team’s quantitative setup in the XLF shows 0.9% upside to TRADE resistance and 1.2% downside to TRADE support.